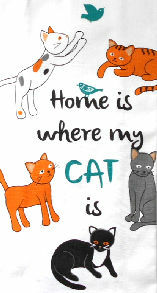 We know the truth of this saying: Home Is Where My Cat Is. This 100% cotton towel is 16 1/2" wide x 26" long. Finished edges. New.